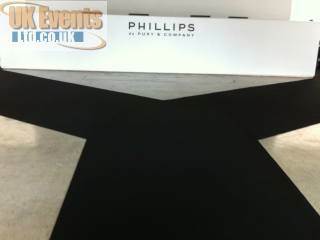 Hire a VIP Carpet to enhance your entrance. Choose from a range of colours and add ropes and post to finish off your VIP Entrance. Enhancing rooms is what we do best. Get in contact today to see how we can transform your function room. 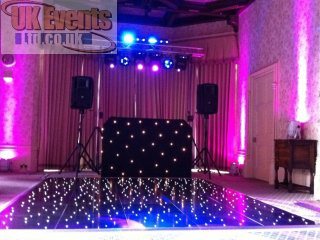 Dance Floor Hire company renting all varieties of dance floors which include White LED and Black Starlit, Plain Black and Plain White, Black and Whitechequered, Oak Parquet, outdoor and our Saturday night fever 70's LED Dance Floor. 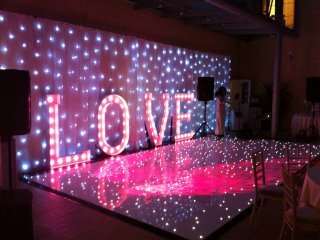 New to our list of flooring is a stunning hot Pink Starlit Dance Floor - perfect for themed weddings and birthday parties. We also supply Stages, LED Furniture Hire, PA systems, Inflatable stage roofs, VIP Red Carpets runners and LED Cocktail Bars to name just a few amazing products. All our products are specifically chosen to enhance any function room. Whether you are looking to hire a stage for a band, concert or outdoor festival or arranging a birthday party and require light up furniture and room uplighters, we can put a package together and exceed all expectations when it comes to the end result. We’ve been enhancing events since 2009, each year providing better products with exceptional service. We understand that every event is different and offer a personal service, ensuring our clients are assisted every step of the way. We aim to create a perfect event for all your guests to enjoy and talk about long after your all important event has passed. We have made a huge investment in the latest products some of which are exclusive to UK Events. We are the first company in the World to be offering the stunning hot pink starlit dance floor which is currently available in any size up to a 20ft x 20ft configuration. We now stock high quality love letters which are the perfect add-on for a Wedding or Anniversary. Our latest cocktail bar has a pixelated screen allowing animations, images and scrolling text to be projected across the front of the bar. Please take the time to look through our comprehensive site, where we hope you will find inspiration from some of the jobs we've already successfully carried out. We have just lowered our prices on our best selling products. This includes our starlit LED dance floor range and LED products - Our prices are now the lowest the've ever been. 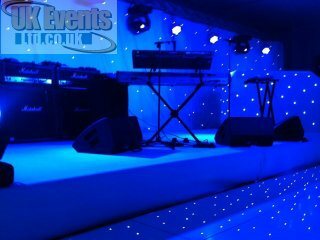 UK Events is one of the largest suppliers of dance floors in the United Kingdom. We have a wide range of dance floors to meet your requirements. Starlit LED - Available in a white or black finish. It has bright white LED lights flash with the surface that twinkles to give you a starry night effect. Pure White or Black - Plain white or black dance floors to match a colour theme you may have for your event. Oak Parquet - The traditional dance floor for any style of event. Outdoor Flooring - The all new weather-proof dance floors ideal for laying on grass. Night Fever LED - The 70's style colour changing blocks for a themed event. Illimilok RGB Pixel - This ALL-NEW colour changing LED pixel dance floor has funky patterns running across it, images and text. We are as always investing in our Conference Packages, Stage and staging side of the business to bring that up to and beyond the level that we are at with our dance floor hire side. We are proud to have taken over a Bespoke stage and set design company. Also in 2015 we have invested into LED bars. The all new colour Commander circular and straight sectional bars and even reception areas for say a VIP area. LED and furniture have also been expanded on bringing us up to date with stocks and the latest equipment in the industry. 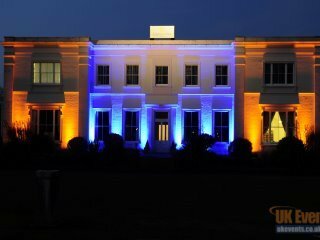 At UK Events Ltd, Distance is no object we travel the length and breadth of Britain and regularly work across Europe. We run a fleet of reliable, modern vans and our keen, trained technicians will travel through the night in order to get to your venue ON TIME. Vibrant and practical LED Furniture and soft furniture can really attract the attention of guests. Most of our LED furniture is wireless and controlled by a simple remote allowing you, the client, to have complete control of our products. 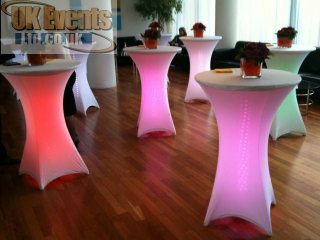 We offer Poseur Tables, Table Centres, Cocktail Bars, LED Cubes, Uplighters and Banquet Tables. Light up your event with LED furniture. 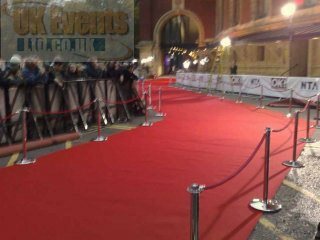 If you are looking to create an Oscar style entrance then a VIP carpet would be the perfect choice. We can supply carpets in almost any colour to match you theme with ropes and posts to finish off the VIP look. Choose from a 2m or 4m wide carpet (we can cut these down if required) at the length you require. Let our team arrive and professionally install the carpet. We can install Catwalks and carpet existing stages too! UK Events started its journey by offering high quality professional discothèques to the events industry. We have some of the best mobile DJs in the industry specialising in Weddings, private parties, corporate functions, Bar mitzvahs, Birthdays and VIP exclusive events. We select the perfect DJ to match your event and requirement ensuring you will have the best DJ performing at your event. We can offer stages for any application to meet your requirements. Whether you are looking to book a standard stage for a band or a colour coded catwalk, we can design a staging system custom to your needs. We can offer festival stages fully covered with our all new inflatable stage roof for indoor and outdoor use. Each stage section measures 2m x 1m and can be made to a height to suit your requirements. We can also work in 0.3 metres making our stage very adaptable to tight spaces. We use the industry standard StageDex stage systems to ensure a safe structure whatever the application. We can dress a stage, erect a backdrop and supply sound and lighting systems to offer complete solutions. We have access to one of the largest stock piles of stage in the country. No job is too big or small for our team! 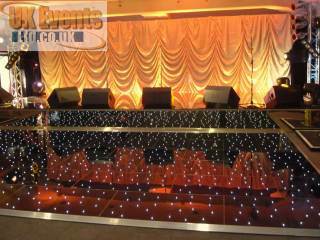 Star cloths are a great way of creating a gala style background which is commonly used for bands, discos and even draping areas of rooms and marquees to create a touch of class to the overall look of the function space. We use a simple extendable pole system which holds the starcloth straight and close to the wall freeing up valuable space. Larger truss systems can be used if desired. We can drape a small area right up to a complete exhibition hall. We will work around fire exits and doorways as required to comply with health and safety obligations. 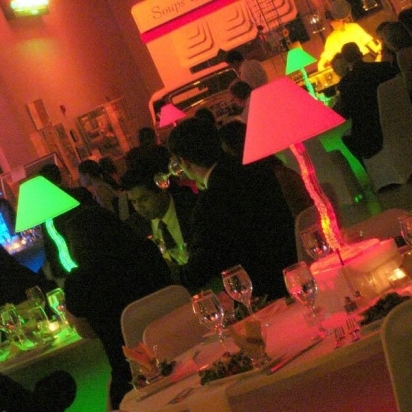 We are happy to now offer a range of LED vibrant table centres to enhance your event. We aim to offer an extensive range of products to suit all tastes. We believe that our products are the best in the industry, so make sure your party or function is the best it can be. All of our LED products have been designed to compliment each other. When you find the table centre you love, take a look at our LED furniture and lighting products to see how we can enhance your event even further. 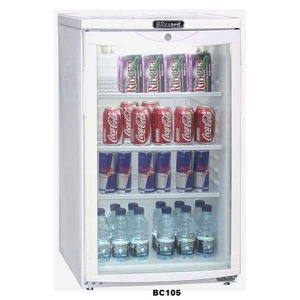 Fridge and Freezer hire for exhibitions, events and any other occasion you may require to chill or freeze your products. 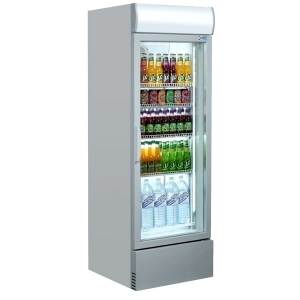 We offer great rates for long term hire to save you the hassle of purchasing fridges or freezers which will no long be required after your event or exhibition. 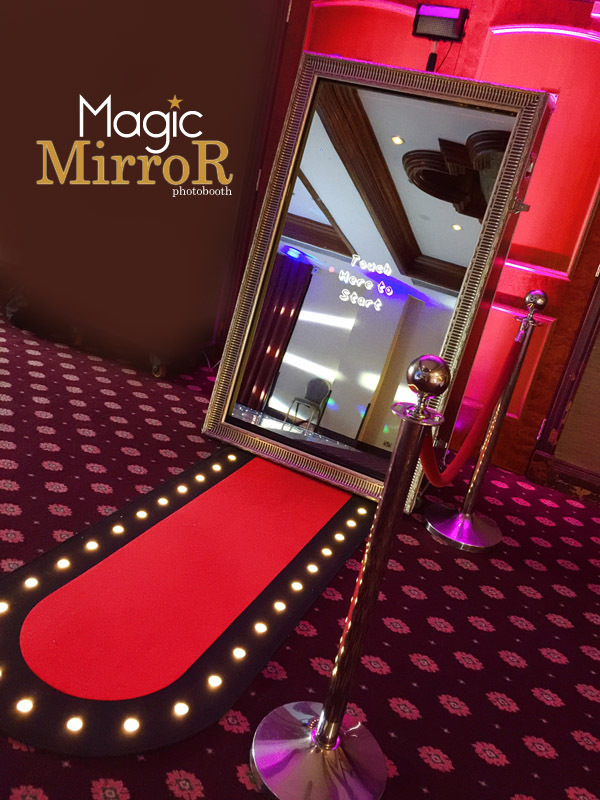 Add some additional fun and memories to your next event with our popular photo booths and Magic Mirrors/Selfie Mirrors. Let your guests get involved and take photos or short video clips which in turn can be duplicated so you can have a copy to re-live the fun you and your guest had. We are working hard to add exceptional live entertainment to our portfolio. We are currently working alongside many various acts, so come back soon to see what we will be offering to liven up your event. 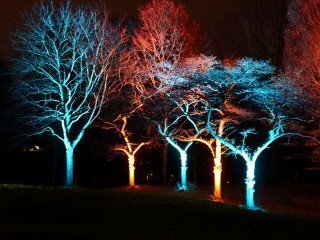 We can transform buildings, trees and any other outside items with our wireless battery operated LED flood lighting packages. We've been carrying out events since 2009. We are very proud of the constant exceptional feedback we receive and feel it important to share this with potential new clients to reassure them of our amazing service and customer feedback. After every job is completed, a feedback form is sent to the client. This is crucial to us as it helps monitor and improve our services. Brittany was super helpful in the booking process. It was really simple and straight forward and hassle free - just what you want when you are planning a big event. The two crew members who installed the dance floor on the day of the event were really polite and friendly, they asked if everything was okay and If I was happy with everything before they left. I was very impressed that they came to find me to check that I was happy with everything. All of the Staff I had contacted were very polite and friendly. The installers were punctual and carried out their work with a minimum of disruption. I have used UK Events for a couple of years now and every time I do so the staff are very helpful and respond to my questions quickly and efficiently. The install was polite and just got on with this job asking if everything was ok with the set up before he left. I would definitely recommend UK Events to anyone organising an event. Thank you for your help once again. Excellent service from all covered. Looking forward to using UK Events Ltd again in June when we have x2 parties to sort. 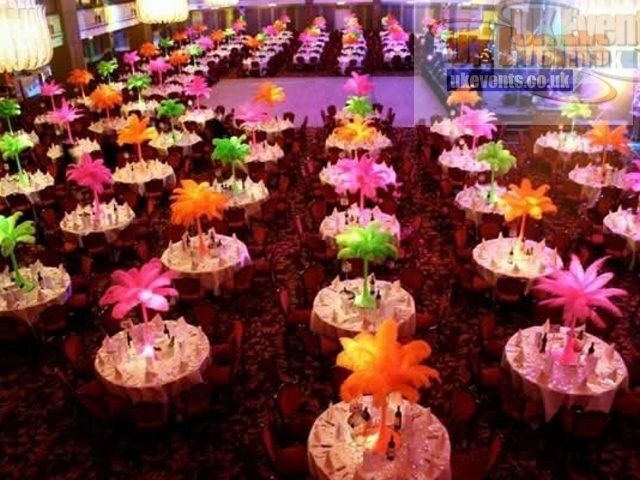 UK Events Ltd offers a complete room tranformation service which will enhance your event and make it one to rememeber. Get in contact to see how we can transorm your next event.